Find the isosceles triangle of a given perimeter K which has the greatest area. We can make sure of the correctness of this very easy to square and arrange the inequality. It can also be see and this is an important thing: that equality holds if and only if the two numbers are equal. Let us look at a simple application. When will be the largest one the product of two positive numbers if we know that the sum of them is 2? Let’s the two numbers a and b, and replace a + b to value of 2 in the above inequality. We can see that the product ab is up to 1. If a = b, then the product is 1. If the two numbers are not equal, however, it is definitely less than 1. So we get the maximum of the product if the two numbers are equal, so there are both just 1. Among others Frigyes Riesz and György Pólya provided very nice proof of arithmetic-geometric mean inequality for any list of n nonnegative real numbers. 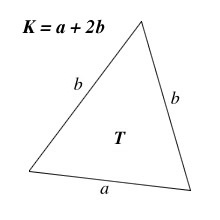 and that equality holds if and only if a = b = c = d.
From this we can read the maximum value of the area, which is when 4 above numbers are equal to each other, that is when a = b, so the triangle is regular.